Terri Harlow was on her hands and knees, cleaning a section of the floor in the front parlor when she realized she wasn’t alone. A small cat approached her, twitching its tail in a manner that made her believe it wanted to be petted. Before she could even reach for her camera, the cat disappeared before her eyes. 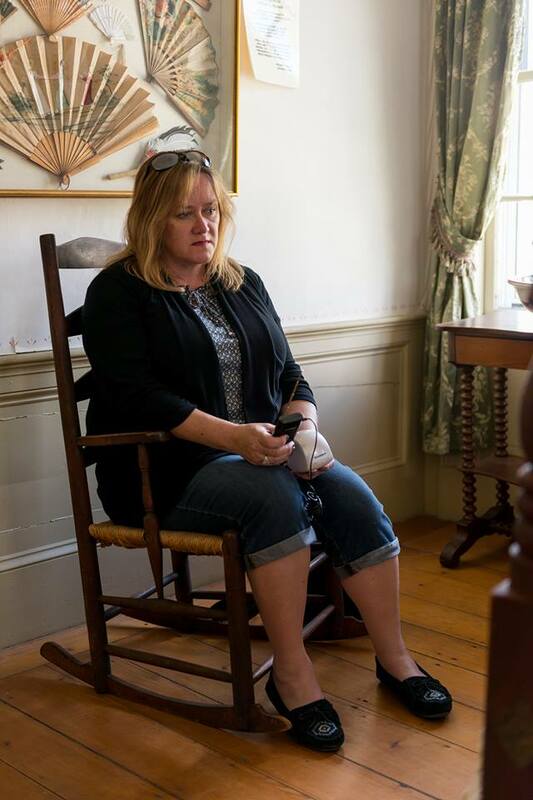 As the curator of the historic Amos Blake house in Fitzwilliam, New Hampshire, as well as the founder of Conscious Spirit Paranormal, a local paranormal investigative group, Terri has witnessed more paranormal phenomena than she can fit into a conversation. 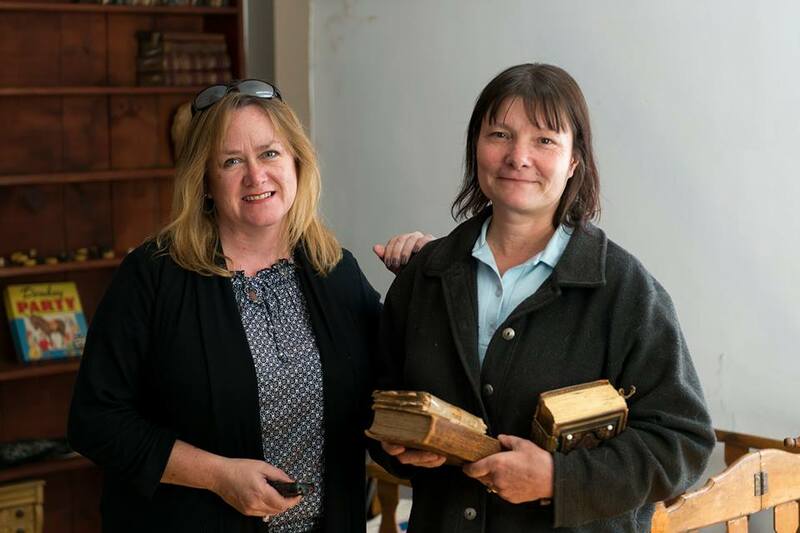 Every room in the 1837 house has a story. “There are eleven confirmed ghosts here, not including the cat,” she said with a sly smile, as she led us from room to room in the white clapboard building. When I was invited to tour the building with local photographer extraordinaire, Frank Grace, and his father (also named Frank), I jumped at the chance. Frank told me that we’d be meeting Terri Harlow at the museum, but I didn’t put two and two together until she opened the door and greeted us. I met Terri years ago at an event at the Haunted Victorian Mansion and was thrilled to see her again. After we had a chance to do some catching up, she took us on a tour of the building, explaining each room as we went along. It was quickly apparent that the house doesn’t whisper with history – it screams with it. Every room in the perfectly preserved house is filled with antiques and artifacts from the days when Amos Blake walked the land. Amos Blake was a prominent man in Fitzwilliam in the mid-eighteen hundreds. Besides being a lawyer, he was also a community leader and state legislator. He purchased the house in 1865 and used one of the front rooms as an office for his law practice. When he died in 1925, his son Leroy transferred his insurance business to the home and assumed residence. While Amos was a pillar of the community, his son Leroy was better known as a ladies’ man, as well as a hoarder. “When he died in the 1960’s, this room was filled with stuff. There were paths through all of it,” Terri told us as we walked into the kitchen area. “Most people think hoarding is something that only happens today, but it happened back then as well,” she added. Leroy Blake was proof of that. We continued on to the front parlor, where Terri once saw the ghostly cat, and then to Amos’s original office space, outfitted with his original desk and furniture. I was amazed at how much of his original possessions remained with the house. It was like stepping back in time. His desk sat in front of the window, outfitted with tools from the trade. An old telephone sat beside an old ink well, items that actually once belonged to the Blake family. Terri then took us up to the second floor, which was once divided into apartments. Each room was a treasure, filled with antiques from the era. One room was filled with old toys. Cribs with creepy life-like dolls occupied the space, along with a glass showcase filled with delicate old play things. “A man from New Jersey donated these two bears,” Terri said, showing us two elderly teddy bears in the glass case. “He comes by on occasion to visit them. Isn’t that the sweetest thing? I love it,” she said with a smile. “Has anything paranormal ever happened in here?” I asked her. Terri got a gleam in her eye as she showed us the mantle above the fireplace. “I put several toys on the mantle and came back a few hours later to find them way over there on the floor,” she said, pointing to an area nearly six feet away. Considering she was alone in the building at the time, this was interesting information. Other items in the house move as well. A catnip toy brought in for the ghost cat is frequently found in various places in the house, as if a cat had been playing with it. A shadow person was also photographed in this room in the corner. When the paranormal television show Ghost Hunters came to shoot an episode there in 2009, a chain in the current country store moved on camera. While several people have debunked the phenomena, stating it was caused by an investigator walking through the room, Terri was quick to tell us that it’s something that has happened many times since. The building is haunted. It’s no surprise that items often move on their own. Knowing it was a haunted location, I had my digital audio recorder running for the duration of the tour. As we stepped into the hallway, I got my first EVP. An EVP is a ghostly voice that is captured on a recording device but isn’t heard at the time it was recorded. Capturing one or two during a standard investigation is good. Finding one during a daylight tour of the facility was like hitting a jackpot for me. A voice said, “behind you.” Click on the link below and it will take you directly to my Soundcloud page where the EVP is located. The next room we walked into was a room dedicated to a local doctor. Dr. George Emerson practiced medicine in the town for many years during the earlier part of the last century. After he died in the late 1950’s, his son donated his equipment to the museum, including an old wheelchair, medical instruments, and medicine bottles, including several labeled snake oil, and liver pills. An odd doll was propped up on a shelf. I asked Terri about it, and she explained that it was used to teach new mothers how to care for their babies. I captured an EVP during this time, as well. Terri showed us a room set up as a bedroom, with old-fashioned stenciling on the walls and an antique rope bed centered in the room. Frank marveled at it, telling us that is where the phrase “Good night, sleep tight. Don’t let the bedbugs bite,” came from. Before bedtime, they would tighten the ropes on the bed to make the mattress firmer. I attempted to conduct an EVP session in the room, but was later dismayed to learn that my recorder was mysteriously turned off three seconds into the recording. Another room on the top floor was a costume room, with beautiful dresses and outfits from every era of the late eighteen hundreds and early nineteen hundreds. Terri would like to make the room into a girl’s bedroom and is looking for a historic canopy bed. If anyone has one they’d like to donate, she’d be delighted to take it. We also toured a room dedicated to the Fitzwilliam Band, with various instruments and uniforms displayed around the room. Terri caught my attention when she said that the band traveled all around New England and had visited Gardner, Massachusetts frequently. Since I’m currently writing a book about the S.K. Pierce Mansion in Gardner, it made me wonder if the band every played there, as well. Next door was the military room, with artifacts and uniforms from the various wars, including the Revolutionary War, Gettysburg, and World Wars I and II. In the corner was a cape that was worn by a general to George Washington’s commemorative service in 1800, one of the oldest artifacts in the building. 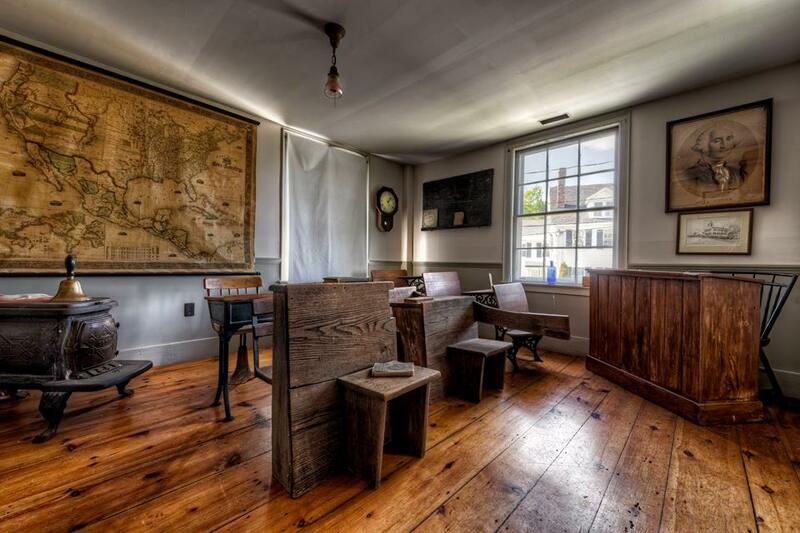 One of the most interesting rooms was the schoolhouse room. Over the course of the past decades, the museum has collected an assortment of old school desks and antiques, including a photo of George Washington, an old wall clock (placed at the back of the room so the children wouldn’t be preoccupied by it), and a teacher’s desk. It wasn’t difficult to imagine children from the past sitting at the desks, watching the teacher write the day’s lessons on the chalkboard. Once during a tour, Terri heard sounds coming from the room and returned to find several lines drawn on the chalkboard. Judy wasn’t happy when her friend brought a Ouija Board to her slumber party, but she didn’t want to be a spoiled sport. All the other girls were excited, gathering around the board, waiting for their turn to talk to the dead. At first, they began getting interesting responses to their questions, but after a while, the responses turned darker. Instead of telling them the names of their next boyfriends, it began answering all the questions with terrifying words like: kill, murder, and maim. Judy insisted they put the board away, but the event was far from over. Days later, Judy began hearing footsteps in the empty house and loud thumps on the walls. Had they conjured an evil entity through the board? Is it a board game or a divining tool for the devil? As I set out to write this blog, I quickly learned that there are few grey areas when it comes to people’s opinions on Ouija Boards. They either love them or they hate them. Messages began pouring in the minute I posted a question on Facebook about them. So, what’s the fuss all about? I probably don’t need to describe an Ouija Board to anyone. We’ve all seen them in horror flicks and paranormal reality shows. For those who have been living under a rock for the past hundred years or so, a spirit board is a game board that is marked with the letters of the alphabet, the numbers zero through nine, the words “yes” and “no”, and typically the words “hello” and “goodbye”. Users rest their fingers on a triangle or heart-shaped game piece, often called a planchette, while an unseen entity supposedly moves the indicator to spell out a message. Many people consider spirit boards to be a form of automatic writing, a practice that allows ghosts to convey messages by spelling out words on paper. They gained popularity in the late 1800’s as the boards became easily obtainable and can be currently be found in most department stores or online shopping sites, sitting side-by-side with family favorites like Candyland and Monopoly. For many people, the question is simple. 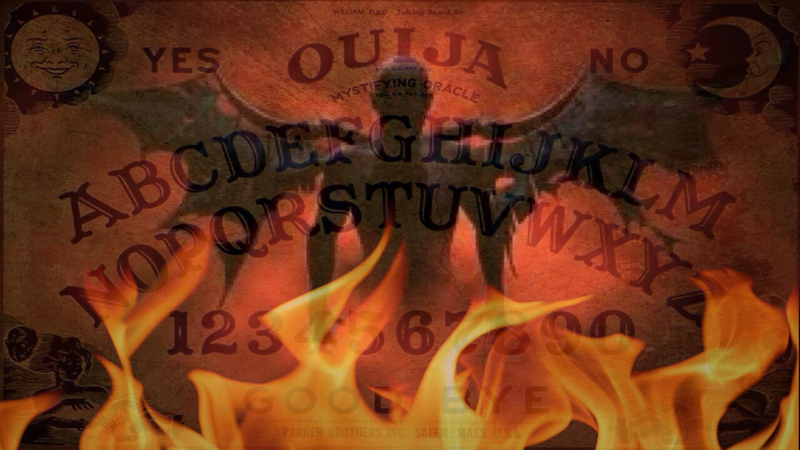 Why would an Ouija Board be any different than any other form of paranormal equipment? The answer is a bit more complex. When we conduct paranormal investigations, we use many different pieces of equipment to elicit responses from the spirit world. Tools of the trade vary. A popular device is the Ovilus, an electronic device that is pre-programmed with several thousand words the spirit world can utilize to sound out messages. Others use Spirit Boxes, which use a modified radio that scans quickly through the stations to capture spirit voices. K2, EMF meters, flashlights, and digital audio recorders are also frequently used as communication devices. The one thing that separates these devices from a spirit board is the conduit. While the other equipment allows the entities to communicate through the device itself, a spirit board requires a host to convey the messages. For me, that makes all the difference. In my book Ghostly Defenses: A Sensitive’s Guide for Protection, I don’t recommend investigators to invite a ghost to touch them or use their energy. Personal contact can lead to a multitude of unexpected complications including a paranormal hangover, where an investigator is drained of energy, as well as spirit attachment, where the entity actually follows you home from the investigation. Maintaining a safe distance is often essential in keeping yourself protected. It only takes one wrong move to turn your life into a living hell. I say this from personal experience. I wrote the book The Soul Collector after I ran into a very nasty negative entity that brought me to the brink of disaster. With that said, it won’t surprise anyone that I have mixed feelings about spirit boards, especially when they are used by inexperienced people. In some cases, it could be the equivalent of handing a loaded gun to a person who has never seen a gun before. The results could be fairly predictable. A friend who wishes to remain anonymous shared the following story with me. They lived in a haunted house and frequently used an Ouija Board to communicate with the resident ghosts, but the sessions eventually grew precarious. While the house had always been active, it intensified greatly after they began using the board. The ghost began to focus on the twenty-year-old daughter. It knew things about her personal life that she hadn’t shared with her family and began spelling them out with glee. The activity soon grew physical as the entity began taking control of her body. Something began moving her arms, making them tremble and point in a specific direction. At times, her arms would twitch and shake beyond control, something her father could feel by touching her. The family quickly stopped using the spirit board. While the activity in the house continued, the entity ceased the physical attacks. Others have different takes on the boards. Frank had also had a life altering experience using a Ouija Board. While his sister and her friends used the board at a slumber party in the family’s basement, he sat at the edge of the room, watching them. He had a crush on one of his sister’s friends, but at fifteen-years-old, he was too shy to do anything about it. One of the girls asked the board if it had something it wanted to tell them. It promptly spelled out “Frankie loves Bonnie.” Frank was mortified and ran upstairs in embarrassment, but the message served its purpose. Frank and Bonnie are now married with two children, having been together for twenty-one years. Is this really possible? Can a piece of cardboard and a game piece really conjure up the dead? Heidi’s story conflicts with this theory. While in junior high school, she used one with a friend. Nothing happened in the beginning, but soon the experience changed. An entity came through, telling them he was the father of a classmate who had died. They began asking him questions to validate the response, and he provided them with accurate information. They asked him the name of his boat, and he answered with the name “Princess.” Heidi’s friend thought the information was incorrect. She remembered the name to be “Canasta.” They ceased communication at that point, afraid that another entity was pretending to be the friend’s dead father. Later that summer, when Heidi went to the camp where the boat was docked, she happened to see his boat and was shocked at what she saw. The name on the back of the boat was “Princess,” like the spirit board told them. The stories go on and on. I was shocked at how many people contacted me. Psychic medium, Memie Watson contacted me after reading my post on Facebook, providing me with the following information. “As a child my mother worked at Parker Brothers in Salem, Massachusetts, where they made Ouija boards. They are not the traditional ones from the Egyptian times. We got one as a gift and played with it all the time. We called in spirits and asked them questions. As children, we are more susceptible to having an open mind to spirits. We never have had anything bad happen to us at all. To this day, I still have the original one my mother gave us hanging up on the kitchen wall. Spirit boards and Ouija boards are the same as Table Tipping as they all put you in direct communication with spirits; they are a form of divination as well as the pendulum and dowsing rods etc. Also, psychic mediums contact the spirit, so we must also be protected and cleansed. We always cleanse and consecrate any magickal tool, including ourselves, prior to spirit contact. Upon finishing, we cleanse ourselves as well, as we don’t want Sprits hanging around. Yes, these tools are part of the Occult. While the word has a bad connotation to some, it really only means the unknown or something hidden. They do work and will not bring any ill harm to you unless you believe that they will. What I recommend to others starting out is to respect the board and the spirits and no harm shall come. Never mock them and laugh at them. They are not tools of the devil, as in our belief system there is no such thing as the devil, as it is purely a Christian belief. So any form of communication with the other world is knowledge into the occult, the spirit realm,” she told me. Others have much stronger opinions of Ouija Boards, suggesting they created portals for darker entities to utilize. Tara from Tara Haunted Tours in Savannah, Georgia, recommends caution when dealing with the boards. While she has witnessed professionals utilizing the board without issue, she’s seen far more people get into trouble with them. She believes that when inexperienced people use Ouija Boards, hoping to sense a ghost or conjure their departed loved ones, other darker entities can come through instead, pretending to be the loved one. “They go in, extremely unprotected, thinking they are talking to dead ‘grandma’. Evil poses in many forms. Leave the board alone!” she recommends. My friend, Michael Cram, shares a similar belief. Michael’s history in the paranormal started in childhood. His mother was an Irish witch, someone who often helped others with their problems. A talented medium himself, Michael spent over thirty years in the field investigating claims of hauntings. He also works with the Catholic Church, helping them investigate reports of demonic activity prior to exorcisms. After the owners of the Haunted Victorian Mansion found a handmade Ouija Board in their house following a paranormal investigation, the activity in the house became far more prevalent. They asked Michael to come in for a house cleansing and he quickly identified the entity as something that was brought into the house. He went on to tell Edwin that the types of entities who communicate through Ouija boards were from a lower astral plane, the type you don’t want to welcome into your home. Once you ask for a physical confirmation, such as a knock on the wall or a flicker of a candle, you are essentially opening a portal, allowing them in. Once they come through, they don’t always leave. Michael completed his cleansing, but the entity would prove difficult to remove. Personally, I’ve avoided Ouija Boards, fearing I would create a situation I couldn’t control afterwards. Being a sensitive, I already contend with ghosts following me home from investigations and haunted establishments. The last thing I needed was to create a doorway inside my own house for them to come and go as they wished. I decided that a call to Barbara Williams was in order. Barbara Williams is a very talented psychic medium from Casco, Maine. After meeting her at an investigation at Parsonsfield Seminary, another very haunted location, I began reaching out to her to learn more about the paranormal world. She’s since become my mentor, my go-to person for paranormal questions. She feels that a spirit board is a tool, no different from a camera, a pendulum, or an Ovilus. An experienced user will know how to properly open and close a session, like they would do for any paranormal investigation, but since Ouija Boards are sold as toys, they often end up in the wrong hands. “Most people’s first experiences with spirit boards come when they are adolescents. As you know, adolescents are usually very volatile emotionally. They have very strong kinetic energy and are most likely to create poltergeist activity,” she said. She went on to explaining the importance of conducting the session correctly. She feels that safeguards must be put into place. The spirit board must first be cleansed of any lingering energy. If someone else has used it, it could still hold that energy, good or bad. While Barbara doesn’t use spirit boards, she feels that opening and closing a session is vitally important. She recommends beginning every paranormal investigation with a prayer and a blessing, asking for protection from the guides and guardians who protect the users. They should always make the intent very clear, instructing only spirits from the light to come through and preventing dark energy from emerging. Closing the session is just as important as beginning one. After the session ends, whether it is for an EVP session or a spirit board session, the connection must be closed. “Otherwise, it’s like living in the woods in a cabin. If you walk away and leave the door open, you’re going to end up with a lot of bugs,” she said. “If you open a vortex, you must close it as well,” she added. As for the girl named Judy in the beginning of the article — her name was really Joni. My advice to you about spirit boards is to be cautious. Will I use one in the future? It’s highly doubtful, but I am curious by nature. If the right situation presented itself, under the best possible circumstances, I might be tempted. Certainly, it is far more than a board game, but is it a divining tool of the devil? I’ll let you make that decision. Being a sensitive isn’t always easy. While we can sense that ghosts and spirits are present, we aren’t always prepared to handle them. This guide is a starting point for sensitives, giving them direction on how to harness their abilities, while staying protected from negative energy. This guide discusses the various methods for protection from dark energy, including prayers, medallions, and gemstones, as well as step-by-step directions for protection before, during and after paranormal investigations. 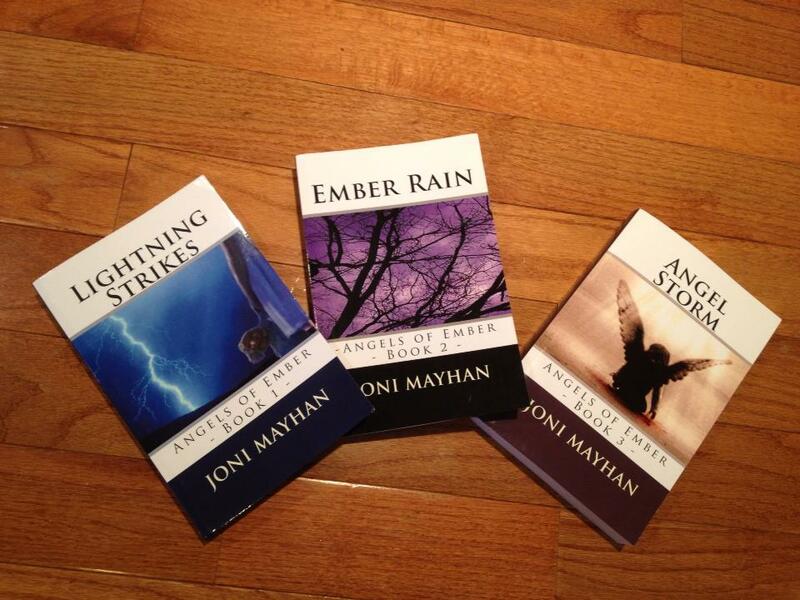 Angels of Ember trilogy – After a devastating virus nearly wipes the world clean of people, 16 year-old Ember Pain grows tired of running and hiding from the bad men who hunt her and her younger sister, Elizabeth. Fighting back becomes a necessity, even if it threatens her very existence.